Outstation students have secured top fifteen places at the G. C. E. O/L examination 2017 according to results released at Wednesday midnight by the Examination Department. The results were first released on the Department website www.doenets.lk first and then posted to schools and private candidates countrywide. Commissioner General of Examinations B. Sanath Pujitha said six students had scored identical marks for the first place. They are Kasuni Hansana Tathsarani Seneviratne and Chamodi Raveesha Subasinghe of Rathnawali Balika Vidyalaya Gampaha, Navodya Prabhavi Ranasinghe of Kandy High School, Limasha Amandi Divyanjana Wimalaweera of Mahamaya Balika Vidyalaya Kandy, Madduma Patabendige Randi Lakpriya of Sujatha Vidyalaya Matara and Kavisha Prathibath Alagiyawanna of Sivali Central College, Ratnapura. Nine students have recorded identical marks for the second place. Nipuni Indeewari Herath of Devi Balika Vidyalaya Colombo, Anisha Geethanjali Gunawardena of Ladies College Colombo, Risini Dinara Kumarasinghe of Samudradevi Balika. Vidyalaya Nugegoda, Kavin Sandeepa Siriwardena of St. Joseph’s College Colombo 10, Thimantha Samadhi Wickremesinghe of Bandaranaike Vidyalaya Gampaha, Senuri Dilru Mallikarachchi of Mahinda Rajapakasa College Homagama, Miruthi Sureshkumar of Vembadi High School Jaffna, Nisansa Kasundi Gokarella of Hillwood College Kandy and Amandi Nayanathara Jayasuriya of Sujatha Vidyalaya Matara. According to results, 73.05% students qualified for GCE (A/L) and it was a 16,607 increase compared to the previous year’s 69.94%. This year 67.24% passed the mathematics subject against 62.81% in 2016. 19,808 students passed mathematics this time than the previous year. 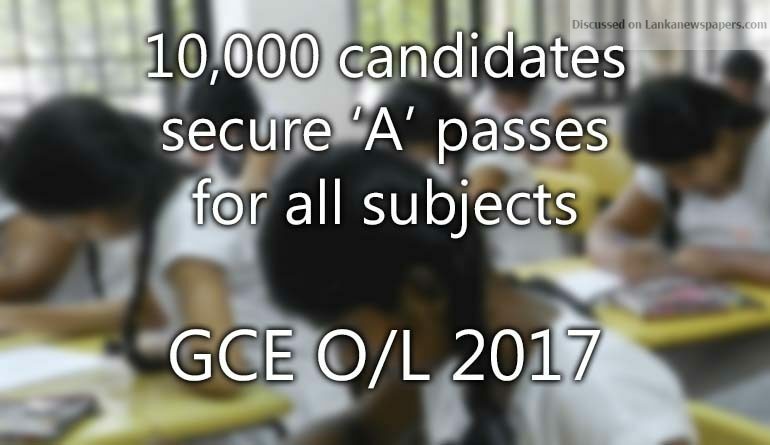 The Exam Chief said 9,960 students had obtained ‘A’ passes for all nine subjects. Pujitha said that if anyone needed any clarification regarding his or her results he or she could contact the School Examinations and Results Division of the Examination Department via telephone numbers 0112784208, 0112784537, 0113188350, 0113140314 or department emergency number 1911. He said those who wanted to have their results re-scrutinised would have to apply before April 07 through their principals. Private candidates will have to do so on their own before April 12 with the model application to be published in the newspapers. Pujitha said the examination certificates for the GCE O/L results of 2017 would be issued from April 02.